Once upon a time, I baked professionally. One of the places that I baked for a living was in the small and charming town of Los Olivos, California, recognized for its fine vineyards and Western Art Galleries. For a few years, I was known as the "Pastry Chef" at the The Los Olivos Grand Hotel even though I have no formal culinary training (however, you should see my extensive cookbook collection - quite an education in and of itself). I baked from scratch all bread for the hotel (every single slice of toast and sandwich bread), muffins, hamburger buns and a full array of dinner breads. In addition I was given complete freedom by the chef, Linda (Linny) Largent Mayer who had come to the hotel having formerly been a chef at Cal-a-Vie Spa in San Diego, to create the seasonal desserts featured each week on the dining room menu. It was in this venue I created many of the recipes you will see from me on future posts. The Los Olivos Grand Hotel was purchased by Fess Parker in 1998, and is now Fess Parker's Wine Country Inn and Spa. I had the great pleasure of making the aquaintance of Fess Parker and his lovely wife Marcy, when they asked to meet the pastry chef one evening when they were dining at the hotel. They were regular patrons of Remington's, the hotel restaurant, and I was thrilled to learn that they were fans of my creations. Of course, I had no idea at the time that a few years later they would buy the hotel. By the time that came to pass, I had moved on, as bakers and cooks often do. (Hmmm...do I stay home and bake, or live in Florence, Italy for the summer to study The Renaissance?) Italy won and that's another story. 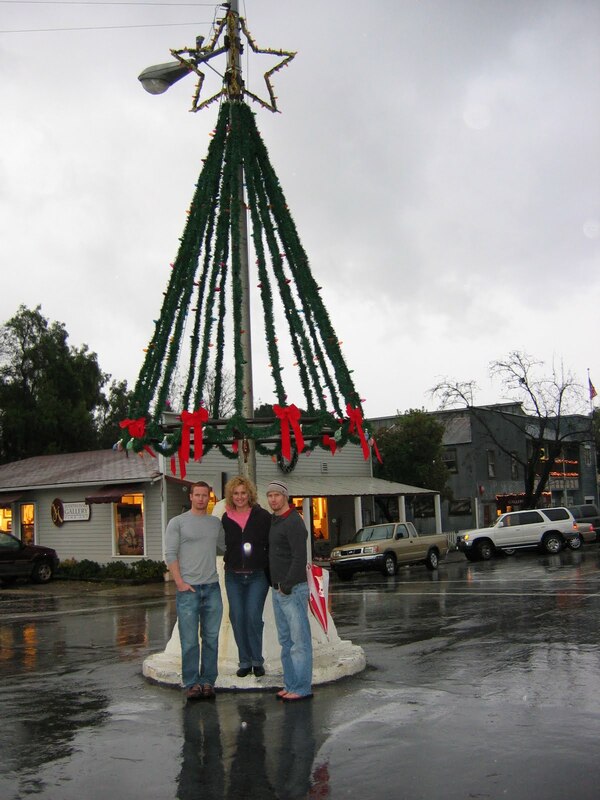 Los Olivos in December of 2005. The town of Los Olivos was made famous by the movie Sideways in 2004, just a couple years after I had moved from the Santa Ynez Valley and made my new home in the San Francisco Bay area. 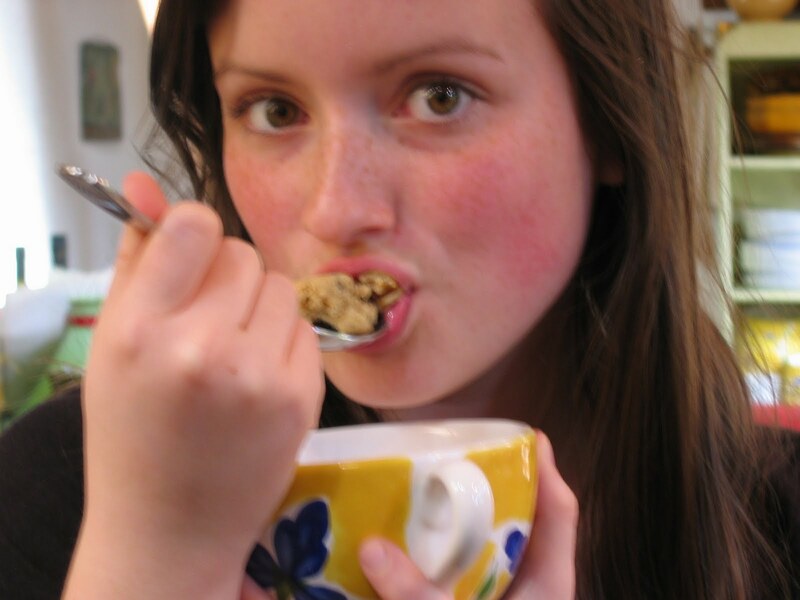 When Michelle and I talked about writing a post on Chocolate Chip Cookies, I was flooded with warm memories of my days spent baking at The Los Olivos Grand Hotel, because that is where I perfected my recipe. 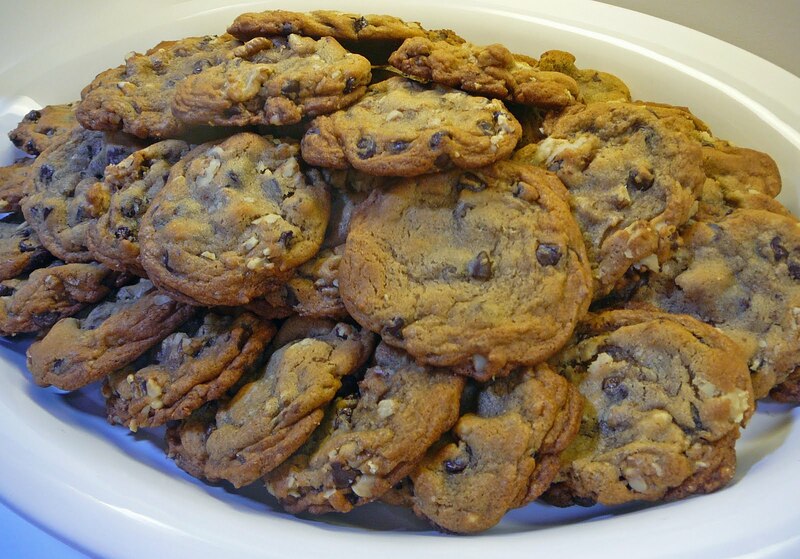 The cookies were a favorite of just about everyone who tried them, including the actor, James Garner, who used to call ahead when he and his wife were on their way north to stay at the hotel for the weekend, wanting to make sure that Linda's Chocolate Chip Cookies were on the menu that day. Over the years I made countless dozens of them for business meetings and to serve on large silver platters on dessert buffet tables. The cookies were also a huge hit at Los Olivos Day In The Country, where we sold the cookies wrapped two to a package, stacked up on large tables on the sidewalk in front of the hotel. This was the enterprising way we earned extra money for the staff Christmas party. Los Olivos will always be one of my favorite places on the planet. Not only because of its natural beauty but for reasons more sentimental and dear to my heart. When in town, we always love to have a meal at the now famous Los Olivos Cafe, featured in Sideways. For me though, the Los Olivos Cafe will always be the place of cherished memories with family and friends, where we have shared delicious meals on many occasions, ordinary and special. When my identical twin sons Jordan and Joshua, graduated from Santa Ynez High School, we continued our celebration there over dinner. It is also the place where I met my son Joshua's girlfriend, Rachel for the first time, who later became his wife. If you are planning a visit, Andrew Murray has a tasting room on Grand Avenue, and both Michelle and I are huge fans of the gorgeous wines that he makes. Hands down though, our favorite place for dinner, was the now defunct Masami. Cantankerous Chef Max made the best Pollo Parmigiana that we have ever tasted. There was one particular evening when Michelle, Richard and I coincidently crossed paths with David Crosby, Noah Wyle and wives at the door. David Crosby was so gracious and good natured, greeting us as with a smile at the door, holding it open for us to enter as if he was a doorman. I bet, based upon his engaging demeanor, he was a wonderful dinner companion. As Los Olivos grew, J. Woeste was a very happy addition to the community because of my love of gardening. It is a great little nursery, a new incarnation for a heritage home and extensive yard, filled with a tantalizing array of plants, statuary and fountains. Panino moved in on the main corner in town and is a good place to grab a gourmet sandwich. Even if Los Olivos has grown from the sleeply little town that resembles Mayberry RFD (the primary filming location of the reunion movie filmed in 1986), the flavor has stayed true to it's early western roots. Mattei's Tavern, now the Brothers' Restaurant, was a stage coach stop in the late 1800s. There still are no stop lights. The flag pole (which doubles as a Christmas tree during the holidays) with the American flag waving in the breeze, is located in the middle of the main intersection and is a sight that continues to warm my heart. But I digress, back to the basics of baking a great chocolate chip cookie. Secret #1: "Activate" the baking soda called for in a recipe to create superior results in cookies, cakes and just about whatever you are baking. In a shot glass or smallest measuring cup, stir together the baking soda and a touch of warm water until emulsified. If the recipe calls for vanilla, add it along with the warm water. Add the "activated" baking soda to the other wet ingredients and proceed with your recipe. Also, make sure that your leavenings - both baking soda and baking powder - are fresh, if you only bake every now and then. My brother-in-law Jay will attest to the success of the activation method. On particularly raucous Thanksgiving (I recall Michelle and I having been a little tipsy on the Kir Royals we were sipping in the kitchen while preparing the feast), I transformed his mother's holiday Carrot Ring into a Carrot Soufflé. It became a fluffy masterpiece with the addition of this simple trick. Jay's mother was quite surprised at the transformation of her holiday standard. Joan's eyes grew very large and she exclaimed, "Oh my." Much giggling erupted from the cooks. In the same way, I used this technique on the Italian Cream Cake, a recipe given to me by Michelle's best friend to bake for her 40th birthday bash. It was a much different cake than the family was accustomed to, and they were very pleased with the result. Secret #2: Make sure that your dough has enough flour in it. The finished dough should be rather stiff and hold its shape. I form my cookies with a scoop and then slightly depress the top. Secret #3: Let your dough sit covered for at least 20 minutes before baking. 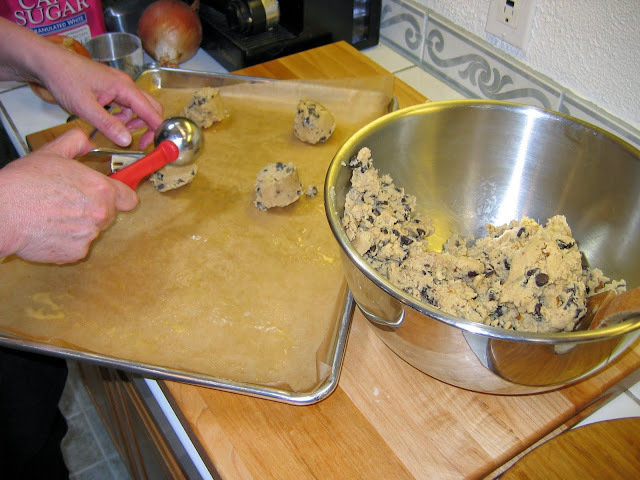 Secret #4: Bake the scooped cookie dough on lightly greased parchment paper. We like the Silicone Coated Unbleached Parchment baking paper made by IF YOU CARE®. It is environmentally safe and non-toxic. Parchment can be saved and reused, as needed for cookie sheets and cake pans. The unbleached parchment is a pleasing antique taupe in color, a rustic and natural looking emblishment in tins packed with candies, cookies or sweets. Secret #5: (All children seem to be born knowing this) eating the dough just might be the best part. On a final note, don't be afraid to make a big batch, although this recipe can certainly by halved. We take the extra cookies and freeze them in wrapped packets of two, the same day that they are baked. We put the individual packets in a Ziploc bag and then in the freezer. When we want "freshly made" cookies, we put the unwrapped and frozen cookies straight onto the rack of our toaster oven for 2-3 minutes at 350 degrees. 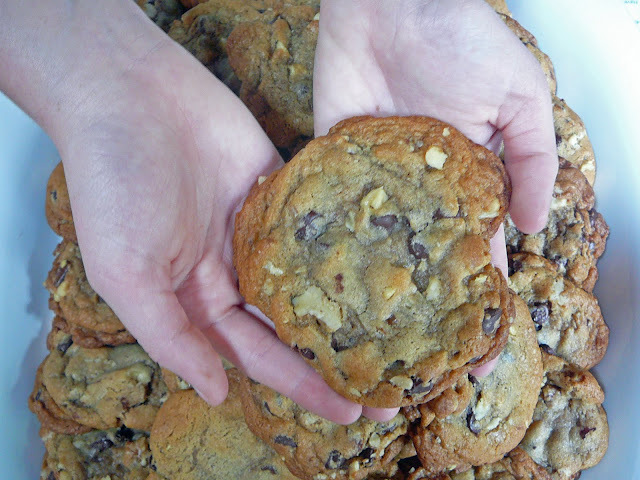 Voilà... you have cookies that taste like they were just baked with the chocolate chips all melty and gooey. The frozen cookies are also great to pop into a lunch. They will be thawed and ready to eat at lunch time. 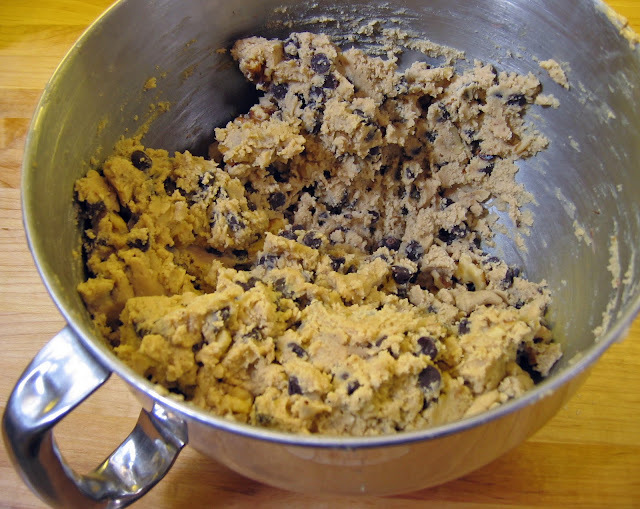 Use a #24 scoop (1-1/3 ounces) to portion dough. 1. Arrange two oven racks so one sits in the lower third of the oven and the other in the upper third. Preheat oven to 350°F. Line four baking sheets with parchment; lightly grease. 2. Blend flour and baking powder together in a bowl; set aside. 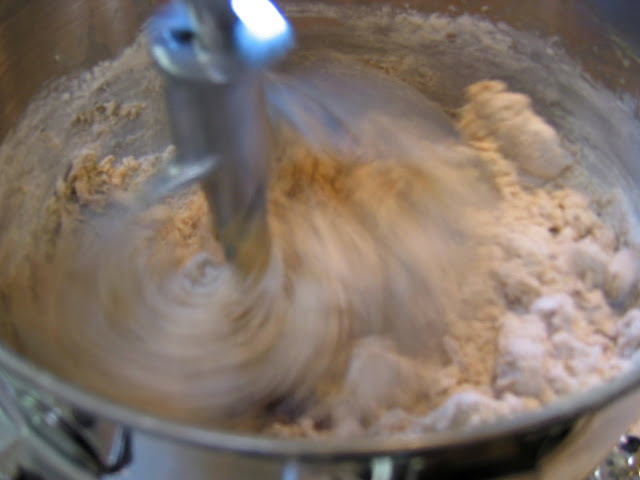 In a mixer, with the paddle attachment, cream butter and sugars together very well. Add eggs one at a time, beating well after each addition. Dissolve baking soda in vanilla with a little hot water then stir in vanilla. Beat into butter-sugar-egg mixture. Gradually beat in the reserved flour mixture. Stir in chocolate chips and nuts. 3. With a scoop, portion cookies, six to a sheet. Slightly depress the dough with your hand to flatten the tops. 4. Put first cookie sheet in oven on the bottom rack, after six minutes, move sheet to the top rack. Immediately slide the second sheet of cookies on to the bottom rack. After six minutes, check cookies on the top shelf - they should be done. Remove from oven; let cookies sit a few minutes before removing to wire racks to cool completely. 5. Immediately place the second sheet on top rack and slide the third sheet on to the bottom rack. After six minutes, check cookies on top shelf - they should be done. Remove from oven and let cookies sit a few minutes before removing to wire racks to cook completely. 6. Immediately place third sheet on top rack and slide the fourth sheet on to bottom rack. After six minutes, check cookies on the top rack - they should be done. Remove from oven and let cookies sit a few minutes before removing to wire racks to cook completely. 7. Repeat process, rotating the four pans until all the dough is baked into cookies. 8. 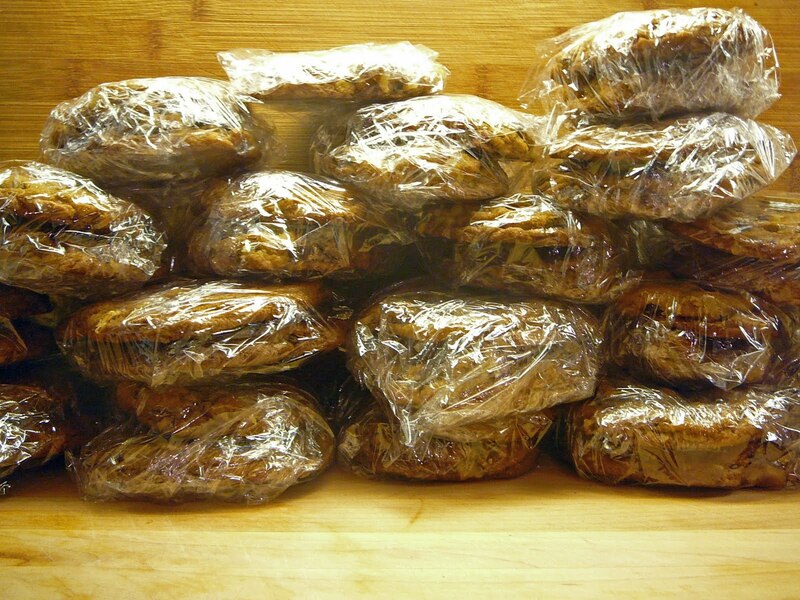 Once all the cookies are cooled, you can package the cookies in bundles of two using clear wrap. Transfer the bundles to Ziploc gallon freezer bags and store in the freezer up to two months. 9. To thaw, simply transfer bundles to lunch bags. They'll be ready to eat in an hour or two. Alternatively, unwrap the frozen cookies and bake in the toaster oven at 350°F for a few minutes for "fresh baked" cookies any time.